Louise Bennett was born on September 7, 1919. She was a Jamaican poet and activist. From Kingston, Jamaica Louise Bennett remains a household name in Jamaica, a “Living Legend” and a cultural icon. She received her education from Ebenezer and Calabar Elementary Schools, St. Simon’s College, Excelsior College, Friends College (Highgate). Although she lived in Toronto, Canada for the last decade she still receives the homage of the expatriate West Indian community in the north as well as a large Canadian following. 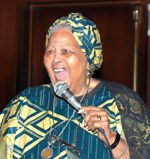 During her life Bennett was the recipient of many awards and honours: MBE (1960), the Silver and Gold Musgrave Medals (1965, 1978), the Norman Manley Award for Excellence in the Arts (1972), the Order of Jamaica (1974), the National Black Arts Festival’s Living Legend Award (1992), the Gabriela Mistral Commemorative Award from the Chilean government (1996), Hon. D. Litt from the University of West Indies (1983) and York University (1998), and the Jamaican Order of Merit (2001). In 1990 she was appointed Cultural Ambassador at Large by the Jamaican government. Bennett died on 26 July 2006 at the Scarborough Grace Hospital in Toronto. Although she and her husband had moved to Canada in 1987, she never forgot her homeland. Their bodies were interred together in Kingston, Jamaica on 9 August 2006. At Toronto’s Harbourfront Centre, Miss Lou’s Room (a reading and activity space for children) was opened to the public in July 2007 on the first anniversary of her death.